Chutes and Ladders, sometimes called Snakes and Ladders in Great Britian, is a very popular children's game where two or more players roll a die or a spin a spinner and move tokens around a grided 8x8, 10x10, or 12x12 board (depends on country). On the board are ladders that connect two different squares that allow the player a shortcut that is closer to the end. Also on the board are chutes, which also connect squares, but when landed on, bring the player back towards the beginning of the grid. The game is best for two to six players. While any age can play the game, it is recommended that ages three to eight play the game. Even though hardly any skill is required, you should play the first few games with your child so he or she can get the hang of the game. The youngest player goes first. The grid squares are number one through sixty-four (if using an 8x8 grid) starting in the lower right and increase by one in a snake-like fashion until the very last square. Each player starts at the number one square. 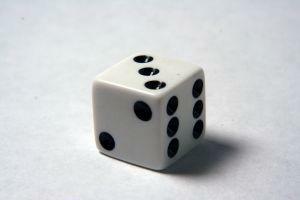 The player rolls one die and moves the appropriate number of squares. If the token lands on a square with a ladder bottom, then that player is allowed to slide up the ladder to the square it's attached to. If the token manages to end on a square with a chute top, then that player must slide down to the square it is connected to. Rolling a six allows the player to have another turn. If that player rolls three sixes in a row, then the player must start at square number one and cannot move again until he or she rolls another six. The game migrated to the United States in 1943 and was renamed Chutes and Ladders. But before it even reached England, the game was played often in India back in the 1500's. Then, the game was named Leela and has had more spiritual aspects. Spiritual teachers used the game to talk about morality to children. For example, the ladders represented virtues like generosity and honesty while the snakes represented vices like lust, theft, and murder. To make the game even more symbolic, those who created Leela boards often put less ladders than snakes on the board to show that the journey of the good path is harder than the journey of the bad path. The U.S. version isn't that far off from the original Snakes and Ladders or even the Indian version, Leela. Chutes and Ladders has 100 squares, which makes it a 10x10 board. The current version uses a spinner instead of a die, but gameplay is still the same: a player must progress square by square up the board moving up ladders or down chutes as necessary. Pictured on the board are ladders and slides (chutes) and caricatures of children engaging in playground activities, which equals what the spiritual teachers were doing for the Indian version. The kids at the bottom of the ladder perform good actions, and for that, they are reward and able to move to the top of the ladder. Those at the top of the ladder reap the rewards. If you look at the children involved with the chute, the ones at the top of the chute perform nefarious deeds, causing trouble and mayhem. Because of that, those kids are punished and moved to the bottom of the chute. Besides the general Chutes and Ladders game, you can also find themed versions of the game. Dora the Explorer and Spongebob Squarepants have versions of the game that have pictures of their respective characters on the board. Rules are basically the same, and these versions would be good for kids who are fans of the shows.